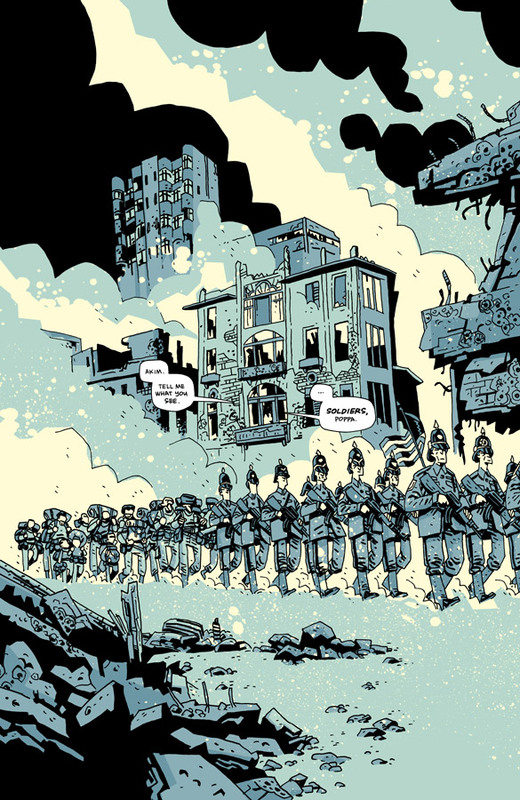 Daniel Elkin: Casanova: Acedia #4 is out and, my god, it’s a thing of beauty. Fabio Moon has taken control of this issue, fully and fundamentally, in such a manner that Matt Fraction’s words end up in service of these pages. It’s as if they were going old school Marvel style and Moon took that guiding principle and set off a radiant and angelic art bomb. I could wallpaper a fetid Appalachian outhouse with these pages and turn it into Trump Tower. But fawn and drool as I will over what Moon has put forth, I must remain critical of the package. There are indeed sounds to go along with these visions, and therein I can be objective. Casanova: Acedia #4 is the flashback issue you didn’t realize you were demanding! Here it is the story to tell of a young Akim Athabadze who became the man he was because of the childhood he endured. Slam! So it wasn’t a game, cracking all the mirrors in shame. This is a brutal tale of retribution and unleashing. Young Athabadze sees the horror of the world only to become the horror himself. But it is a crown that sits uneasily upon his head. Millions weep a fountain, just in case of sunrise. He is the man who hates who he has become, the man his father warned him about. He’s the cracked actor, spouting the lines he wished he never memorized, written by the revulsion that is the will to power. He’s waiting in the wings. He speaks of senseless things. His script is you and me, boys. This is visceral stuff that would turn the stomach of even a Lady Grinning Soul were it not for Moon’s triumphant art. It redeems the repulsion in an almost sensual manner with Cris Peters’ coloring laying belief on you, wrapping it all up in a skin sweet with musky odor. 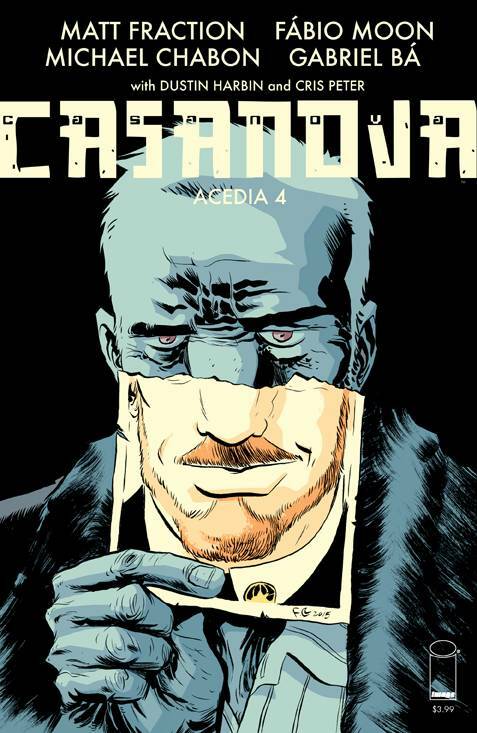 Casanova: Arcadia #4 sits like a man but it smiles like a reptile. It bites on the neon and sleeps in a capsule. This issue raises the bar even further. It loves to be loved … and I love it. Jason Sacks: And I love it too, Elkin. There’s an intensely painful quality in Acedia #4, the quality of a life lived full of compromise, with violence as a constant companion and betrayal a constant threat. There are betrayals of different sorts in this issue, but the most painful betrayal we read about is the one that’s most corrosive of the soul: the betrayal of self. What we witness in Acedia #4 is the continual, despairing letting go of self. It’s the fulfillment of the prophetic words of Akim’s father: “Of the many things that we ‘are’ at any given moment -- the man who hates what he has become is no kind of man at all. Do you understand? No other rules in this life. Of all the things we control, who we are remains sacrosanct.” Those words of wisdom are shared one brilliantly composed panel before the father is shot (in a gorgeously staged off-panel deal, I should add, a panel all the more poignant for its brutal simplicity). 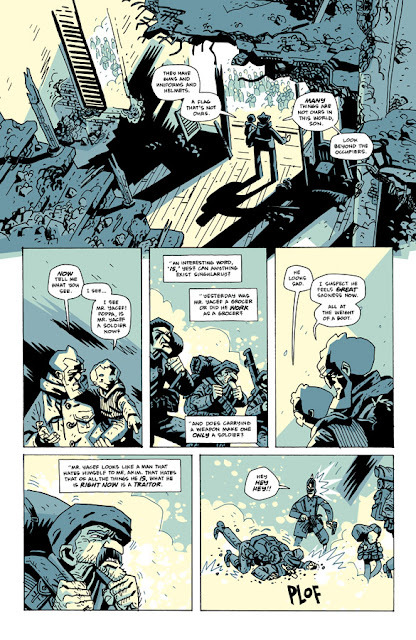 At the end of the issue, after all time Akim spends running around with girls, and all the rules he learns about guns, the time he spends in kennel cages and the time spent he spends torturing enemies, we’re greeted with a scene in which Akim has to confront his true self and determine who he really, truly is inside. And in doing so, Akim provokes all of us to wonder what we would do in that circumstance. We have to wonder how we would react if we were him. 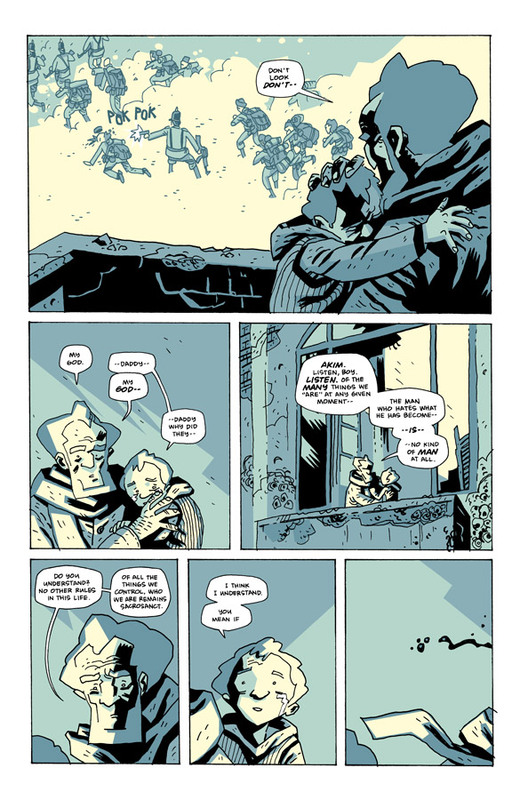 Of course all of this is gorgeously rendered by the luminous Moon, with perfectly composed scenes that threaten tear your guts from your body in wrenching sobs at the same time that they illuminate the majesty of comic art at its apotheosis. You’re right, Daniel. This art is triumphant. I want to luxuriate in it, even when the scenes repel me.. This issue is a bar raiser indeed.